We call it the wavy wall because that is exactly what it is. When travelers head for the exit of the newly designed Federal Inspection Services (FIS) area at the airport, they will not be able to leave without seeing Corpus Christi front and center. “We wanted to give visitors a taste of the city they are about to experience,” said Fred Segundo, the Director of Aviation. 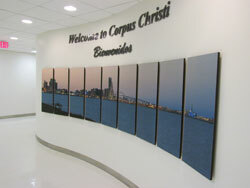 "We felt like the welcome wall, waves and all, was a great place to showcase what Corpus Christi is all about." The art display was created by local photographer Jerry Veglia. Jerry’s picture seemed like the perfect welcome message. "I think Corpus Christi is a special place," said Veglia. "I hope residents and visitors enjoy the beauty of our home and that they get a sense of who we are when they see the wall." We hope so too, Jerry.